The San Diego and Imperial County Electrical Workers Minority Caucus meets at 10am on the first Saturday of every month at the IBEW 569 Union Hall, 4545 Viewridge Avenue, San Diego, CA 92123. All IBEW 569 members are welcome to join. Please e-mail EWMC.Info@Cox.Net to be put on the reminder meeting list. 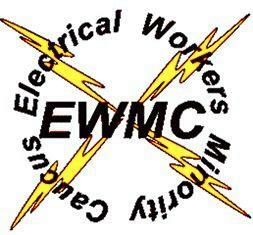 Click here to download the the EWMC Membership Form. The San Diego and Imperial County Electrical Workers Minority Caucus (EWMC) is committed to promoting a vibrant, diverse Local that embraces creative ideas, social and economic justice and equal opportunities for minorities and those from traditionally underrepresented populations at all levels of our organization. These principles are critical to the success of our Local and the strength of our community. The Caucus serves as a support and networking system, and provides education and training for its members. We participate in community volunteering, social events and political activities throughout the year to help advance our mission and promote diversity within Local 569. The mentoring program meets at the Training Center. To sign up or for more information, e-mail EWMC.Info@Cox.Net. To be actively involved in AFL-CIO Constituency Groups, human, civil, and women's rights organizations to advance the cause of minority workers. The EWMC has a long history. In 1974, African American and Hispanic delegates met during the 30th IBEW International Convention in Kansas City, Missouri and formed the EWMC to address the lack of minority representation and other inequalities within the IBEW. Since that time the EWMC has prospered and grown under the direction of President Robbie Sparks, an IBEW Business Manager from Atlanta, Georgia. The success of the EWMC is essentially due to its strong vision and belief in the abilities of people of color. The EWMC is a strong advocate for equal rights, opportunities, and greater minority representation in the IBEW. The EWMC is well respected by the IBEW and the labor movement because of its strong commitment and vigorous pursuit of social and economic justice for minority workers. If you are interested in joining the San Diego and Imperial Counties EWMC, please contact Kevin Alvin, IBEW 569 Business Agent, at 858-569-8900 ext. 107 or email kalvin@ibew569.org. Visit our website for the San Diego and Imperial County Electrical Workers Minority Caucus.